Rörstrand’s Mon Amie bowl is part of Marianne Westman’s beloved tableware collection featuring blooming, delicate flowers of Nordic wetlands. Westman got the inspiration for Mon Amie collection on a rainy midsummer in the late 1940s while sitting and sketching Labrador tea flowers. The cobalt blue flowers of Mon Amie tableware have been an essential part of Scandinavian table settings since their launch in 1952, and the collection’s appearance is still crisp and fresh today. The Swedish porcelain manufacturer Rörstrand launched an updated version of the Mon Amie collection in 2008 to celebrate the 80th birthday of Marianne Westman. Marianne Westman (1928-2017) was a Swedish ceramic artist and textile designer who did a long career at the Swedish porcelain factory Rörstrand. Born in Falun, Sweden, Westman studied ceramic design at Stockholm’s Kostfack University College, and started her collaboration with Rörstrand already at the age of 22. Her debut was the Mon Amie tableware collection, which was released in 1952. 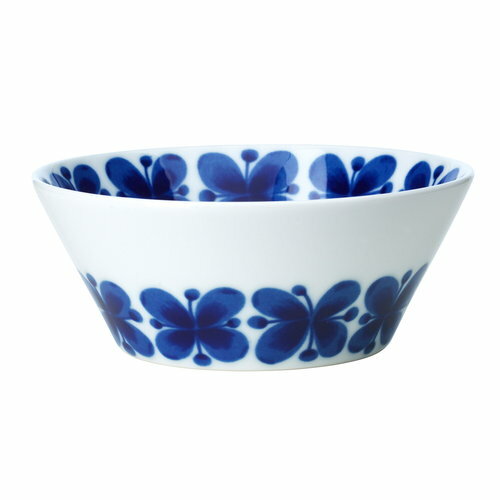 Westman continued to work with Rörstrand until 1971, and many of her designs are today considered timeless classics of Swedish porcelain design.